For most people, going ziplining is a bit out of their comfort zone — and that’s a good thing! Here at CLIMB Works Keana Farms, we firmly believe that new experiences, even when they are a little scary at first, are a big part of what makes life special. Our owner Nick Thompson put it best when he said that ziplining at CLIMB Works is “not about pushing to the extreme. It’s about pushing just beyond the comfortable.” It is the sweet spot of “just beyond the comfortable” where truly amazing things happen. 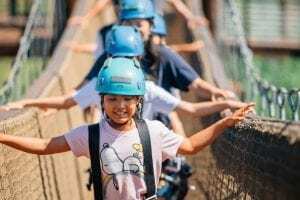 To help get you excited for your visit to CLIMB Works Keana Farms, we have put together five reasons you should venture outside of your comfort zone and go ziplining in Oahu. Author Jack Canfield wrote the wise words, “Everything you want is on the other side of fear.” Canfield is right; all of the most rewarding things in life are terrifying to pursue in the beginning. Launching a business, beginning a new relationship, or starting a family are some obvious examples, but even auditioning for a play or deciding to sing karaoke at a bar can be initially frightening and subsequently gratifying. The best way to overcome fear in your everyday life is through practice. When you go ziplining at CLIMB Works, you will get a masterclass in stepping outside of your comfort zone. Our guides are experts at helping guests conquer their nerves so they can enjoy the unparalleled thrills of soaring over Oahu’s North Shore. Challenging yourself is the first step towards personal growth, and ziplining is the perfect place to start. Many first-time zipliners are ambivalent about taking a tour at CLIMB Works. Some visitors think that they will be able to make it through the course, but they will be too nervous to truly enjoy the experience. In virtually every case, however, these people are pleasantly surprised to find out how much they love ziplining. Once you make it across your first line, a wave of endorphins will wash over you, and you will be raring to get on the next one. Ziplining on Oahu may just unlock a new passion for thrilling outdoor activities that leads you on many future adventures. Of course, ziplining literally offers a new perspective, because you will be whizzing above the treetops at 30 miles per hour. The views of the mountains and the ocean from high up in the sky are absolutely breathtaking. In a more figurative sense, ziplining can help inspire a new perspective on life. Being immersed in Oahu’s gorgeous scenery can often make guests feel more connected to nature and to something larger than themselves. Nothing builds confidence like stepping outside of your comfort zone. We like you to leave feeling like you’ve accomplished something. Completing our zipline course can be a major self-esteem booster, and the results will stay with you for years to come. If a visit to CLIMB Works inspires you to take more risks and go on more adventures, then we have done our job correctly! When you step out of your comfort zone, you’ll have more stories to tell. A zipline tour with CLIMB Works Keana Farms is something that you will be talking about for ages! Friends, family members, co-workers, and new acquaintances will all love hearing about your tour and seeing pictures from Keana Farms. 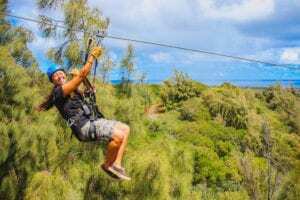 Are you ready to go ziplining on Oahu? Visit our Reservations page to book your tour with CLIMB Works today!